I have about 100lbs of fat back there's only so much cabbage and fat back I can eat. What else do y'all eat with fat back? Or about any bean. 100 pounds is a lot but you could always freeze it? Fry it eat and with lima beans. Canned tomatoes go good with that. Never heard of fat back I assume it's the back fat of a pig? What to eat with it? I don't know but I'm sure you can get creative with it! Now I do do that hadn't even thought about that no one likes pintos much but me now. ga.prime wrote: Fry it eat and with lima beans. Canned tomatoes go good with that. ez14. wrote: Never heard of fat back I assume it's the back fat of a pig? What to eat with it? I don't know but I'm sure you can get creative with it! Fatback aka back fat is gold. It is a firmer fat with a much higher melting point than other fats found on the pig and can be used for a lot of things. Its the choice fat when making salami or other fermented aged meats because it is less prone to smearing so the amount of angel tears are minimized which helps to insure proper drying by reducing the risk of case hardening which can cause spoilage. Here is a pic showing back fat in salami. Its firm texture lends itself well to drying and aging and gives a silky smooth mouthfeel when products like salami are eaten. This is unlike most of the factory meats which rely on chemistry rather than biochemistry in their production. Factory stuff is typically greasy since the use of the more expensive back fat is not as important. 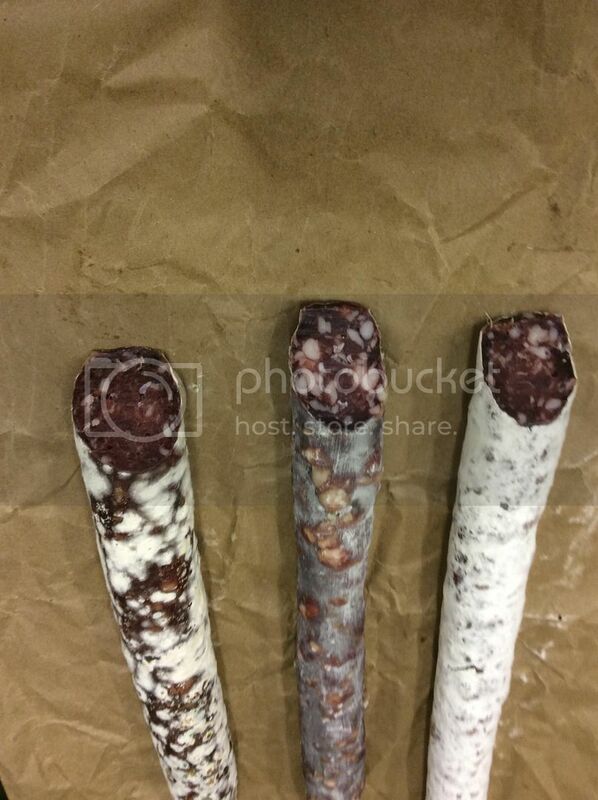 okay your salami looks pretty good is it homemade? Yes, that was venison salami. I use various pork fats to give it a better flavor and texture. The white show pieces are back fat. As the meat dries the stick constricts and the back fat is firm so it doesn't squeeze out grease like other fats would. With everyone wanting leaner pork its getting harder and harder to find good sources of back fat unless you raise them yourself like Sky did. Sky's pigs had what looked like a gold mine in back fat on them. I know people who would buy every bit of his stash only that would be illegal since I'm sure Sky doesn't have that blue stamp of approval on his pigs. Dad used to slice it up and feed it to the dogs along with their regular dog food. Guess you could go into a candle making sideline Works good to slick up a hand saw. Not everything your neighbors do is wrong-Not everything they do is right,either. JW IN VA wrote: Dad used to slice it up and feed it to the dogs along with their regular dog food. My grandmas dog which we still have was stealing pieces of the fatback when I first butchered the pigs and pieces fell I guess he really likes it too. I will tell yall this it should be in the tips n tricks if you need to start a fire fatback will do it for you very well. I would even suggest carrying it in a plastic bag if your hiking or something and may need a fire started.